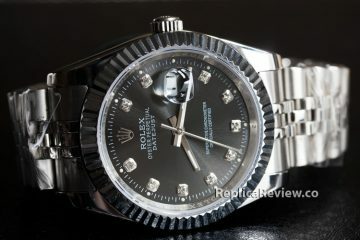 Rolex is one of the most reputable and leading producers of luxury watches globally. Rolex watches are popular in all parts of the world given their aesthetics, accuracy and prominence as a symbol of status. Rolex watches are exotic timepieces that everyone dreams of owning. The Rolex GMT II 116710BNLR is an example of an exceptional product from the famous brand. While the watch was originally designed for professional use, its unrivaled functionality and unique rugged look makes it a favorite of many. The ability of the watch to display different time zones is particularly appreciated by travelers. 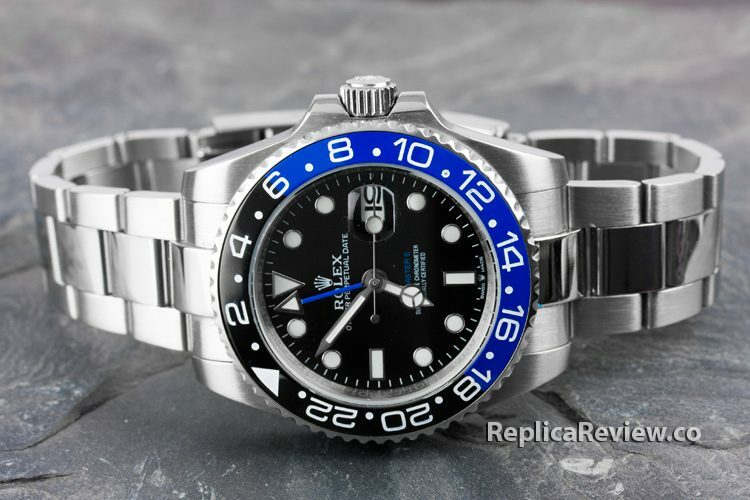 The popularity of the Rolex GMT II 116710BNLR has been taken advantage of by forgers who have produced several fake watches. 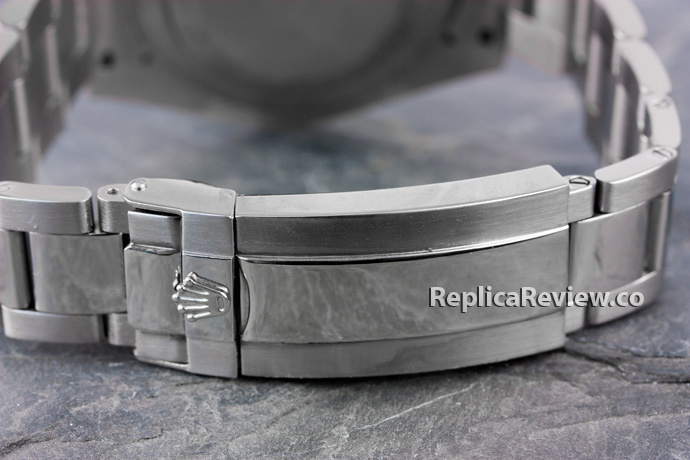 It is however easy to spot a replica of the Rolex GMT II Batman watch from an authentic one. 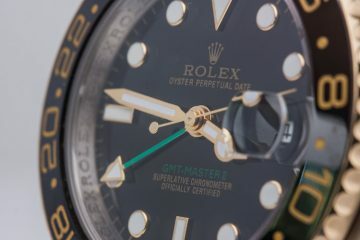 The dial is among the first elements to focus on when comparing an authentic Rolex GMT II 116710BNLR with a replica since it is one of the most prominent features of the watch. 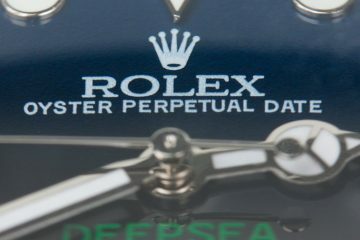 Despite the attempts by forgers to get every detail right on their Rolex replicas, they still make certain mistakes. 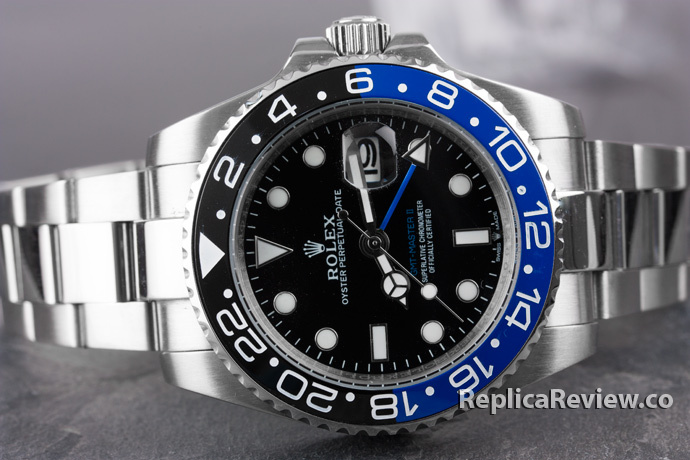 These loopholes can be used to determine a replica of the Rolex GMT II 116710BNLR. Common examples of such flaws are the writing on the dial of the watch. 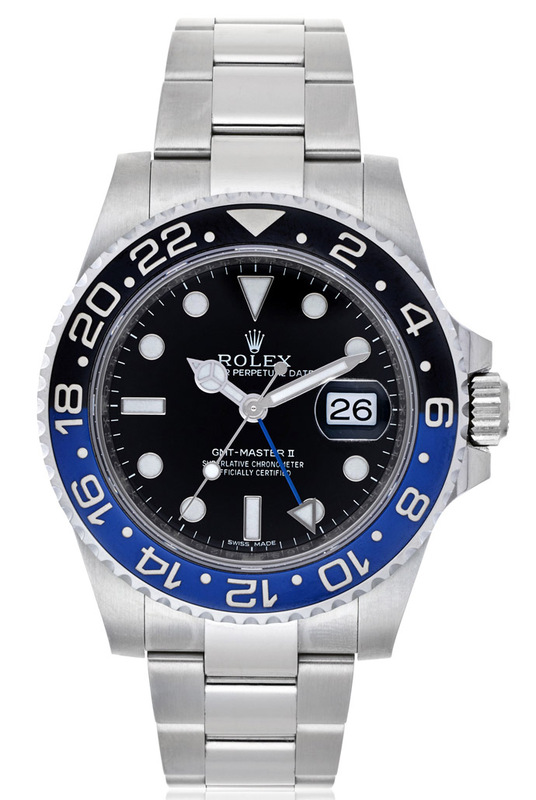 Authentic Rolex GMT II 116710BNLR typically have a “GMT-MASTER II SUPERLATIVE CHRONOMETER OFFICIALLY CERTIFIED” labeled on them. Although the replicas also have similar text, the detail can tell the difference. In the authentic version of the watch, the entire text is written in white. 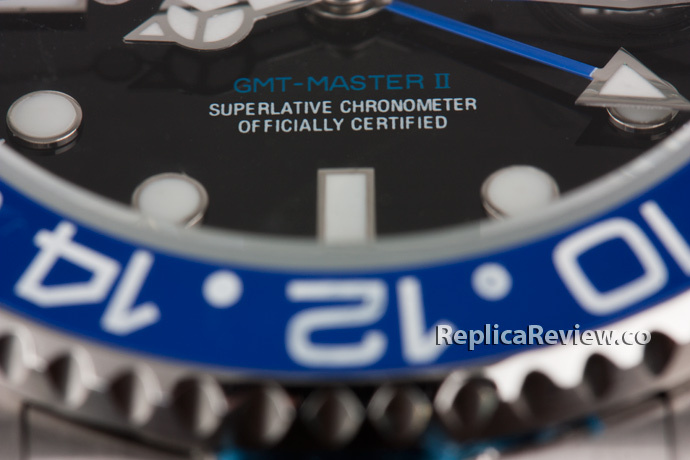 Replicas on the other hand have the first part “GMT-MASTER II” written in blue color. Another detail of the dial that can be used to tell the difference between an authentic and replica Rolex GMT II 116710BNLR is the “SWISS MADE” signature that is centered right below the 6 o’clock marker. For a genuine watch, the signature simply reads, “SWISS MADE” with no additional elements. In the replica however, the signature is “SWISS MADE” with the crown logo separating “SWISS” and “MADE”. The hands of the Rolex GMT II 116710BNLR are another element that can be used in distinguishing an authentic watch from a replica. Three hands of a genuine Rolex GMT II 116710BNLR are generally white in color with white highlights. The color is uniform throughout the hands and is similar to that at the axis at the center of the dial on which the hands rotate. For the replica however, the color combination is quite different. While it has three white hands just like the authentic one, the edges of the hands are black in color. The axis of the replica is also black, unlike the white color on the authentic watch. The popularity of the Rolex brand of watches depends largely on the quality of the products. 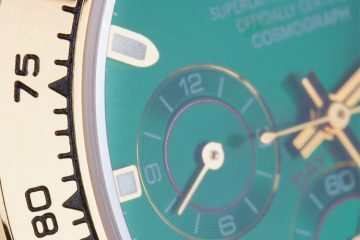 The brand invests on the quality of material it uses on its watches. The quality of material used on the Rolex GMT II 116710BNLR is essential in ensuring the strength and durability of the watch. Besides its importance in durability, the material quality also reflects on the aesthetics of the watch. An authentic Rolex GMT II 116710BNLR is definitely made of the finest quality material. It is therefore strong and looks exceptionally good. The straps and bezel are likely to be shiny and dashing. This is however not the case for replica watches. In order to cut down on the costs of production, forgers tend to use low quality material in their replicas. 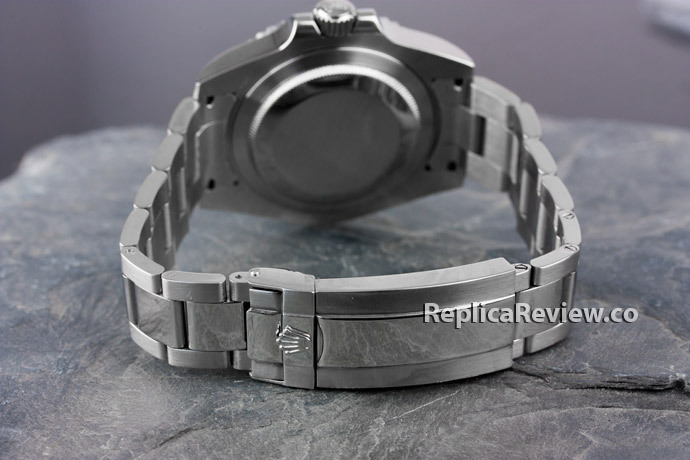 This in turn compromises the quality of the replica Rolex GMT II 116710BNLR watches. The low quality material results in weak watches that hardly last long. The beauty of the watches are also compromised greatly give the type of material used on them. When comparing an replica Rolex GMT II 116710BNLR to authentic watch, you are likely to notice that the replica is a little dull colored and not as shiny as the genuine version of the watch. 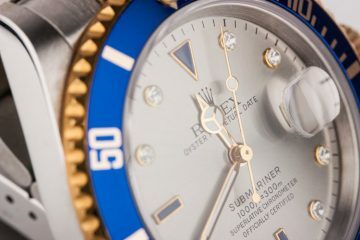 Rolex prides itself in the delivery of properly assembled timepieces. Every part of the watch is well fitted to ensure that the watches match their reputation. 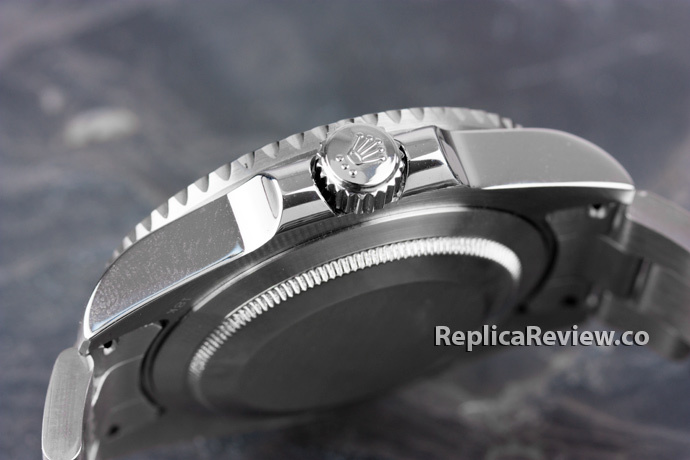 A genuine Rolex GMT II 116710BNLR has a crystal that is properly fastened onto the case of the watch. The fastening is done so well that one can hardly spot any seams between the two parts. 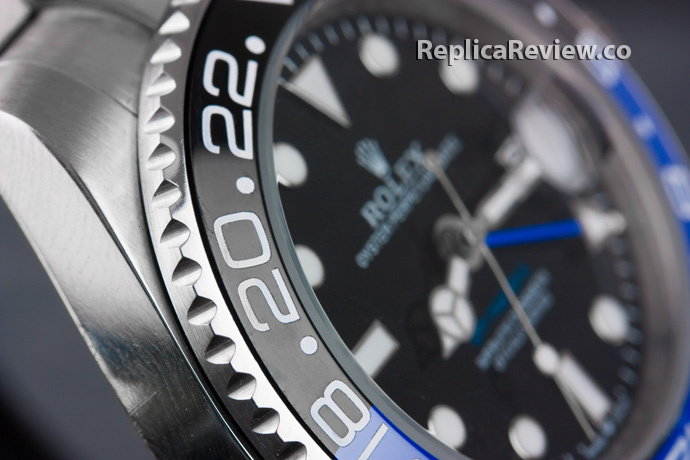 This is not the case with replica Rolex GMT II 116710BNLR. 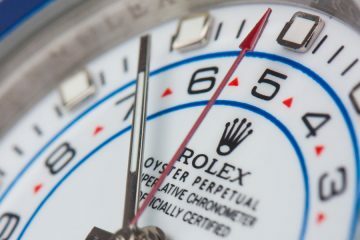 In as much as the fastening is almost similar to that of an authentic watch, some seams remain visible between the crystal and the case of the watch. Comparing the external features of the Rolex GMT II 116710BNLR is a fast way of telling between a fake and genuine watch. There are also inside features like the movement that can be used as well.